Crosses, candy canes, hearts, trees, and other specialty shapes can be found here. Specialty frames are perfect to add some variety to you current offering. Candy canes, crosses and hearts are very popular wreath frames that are sure to be a hit with your customers. These wreath rings are made int he USA by Mitchell Metal Products they feature high quality wire, along with modern manufacturing to create the best wreath ring on the market. 10'' rings with candle holders for making Advent wreaths. The clamp arch is available in three sizes 5 inch x9 inch mini, 6 inch x24 inch , and 8 inch x30 inch. Add ribbons, bows, berry sprays and more to create a one of a kind homemade Christmas decoration or creative Christmas gift idea. The candy cane wire frame makes a great family Christmas project! Make homemade Christmas gifts for friends and family this season. The candy cane wire frame is available in two different sizes and variations. Sold per 25. Spend time together on family projects! And homemade decorating ideas, such as making centerpieces, are great gifts! The clamp centerpiece, one of our most customizable wreath supplies, is available in two configurations 10x6 inch oval and 18" straight. The clamp cross is available in three different sizes 17 inch , 24 inch 30 inch and 30 inch with extension. 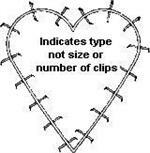 The clamp heart, the base wire frame, is available in two sizes, 18 inch and 24 inch, and is sold in quantities of 25. Add ribbons, bows, evergreen boughs, and more to create a customized decorative heart. Mailbox clamp rings will give your mailbox a festive holiday look. These come in bundles of 25. The 3 foot clamp mantel is the perfect way to adorn your mantel piece, a stunning way to bring one of a kind home decor to your living area. Craft projects are a great way to engage the whole family! Square clamp frames available in two sizes. Clamp stars are available in two sizes 24 inch and 36 inch and are sold each or for a reduced price in quantities of 10. Price listed online is for one star. The clamp swag is available in four different sizes for various Christmas decorating ideas, handmade swags, and holiday themed crafts. 8 inch , 12 inch 9x9 inch corner swag and single clip swag. Our clamp tree is available in two sizes 27 inch and 36 inch and makes a beautiful home decor piece. Also makes a fun family craft project - creating homemade Christmas decorations!